Our route today had been in some contention for quite a while now, over a year in fact! I had read a blog while researching our route saying Farley Road (heading north from Cascade) had roadworks and there was no bitumen for most of it. The other option, the busy 136 which went directly to Dyersville (today’s destination) was notoriously dangerous and the road was like the rest of them around here, broken up by snow and heavy trucks. The bloggers had gotten advice to take a more easterly route via Cascade Road and Rollercoaster Road to Epworth. Needless to say (as their names suggest), the route was much more hilly! Good advice from the locals at Two Ginger’s Tavern had us proceeding up Farley Road though. 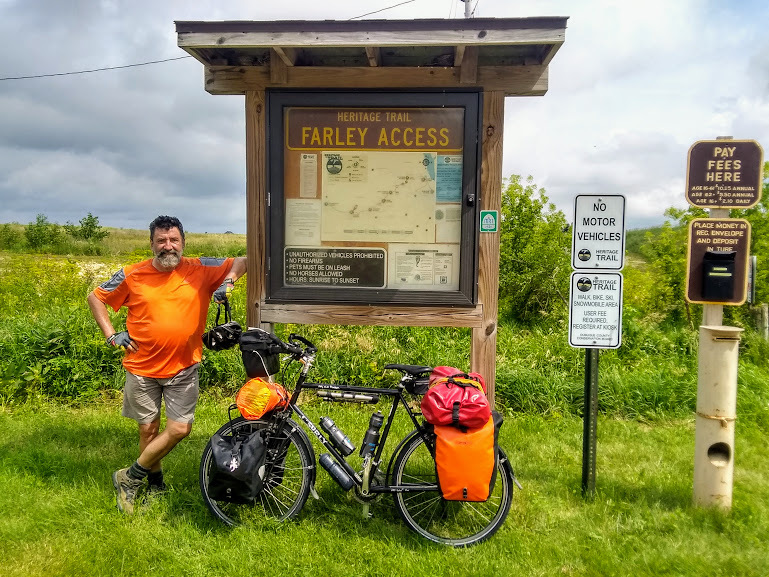 By the look of it, the roadworks had been completed since the blog was written and we had a nice blacktop all the way to Farley, assisted by a nice tailwind. We took some time out at the local Casey’s gas station and got a drink and some lunch. The ACA route had taken us up to Farley to take advantage of a rail-to-trail running east-west and into Dyersville. Just north of Farley, we found the Heritage Trail which runs from Dubuque to Dyersville. It’s a well-maintained trail that you pay a small fee to ride. We actually had a choice of route today. If we had of continued north a few more miles we could have dropped into the Field of Dreams Movie site, however, neither of us being baseball fans, and the fact we were looking forward to getting back onto a dedicated bike trail, we never really entertained the idea of going there, and we rightly chose the trail. Before long we found ourselves in Dyersville. We had booked a Super 8 room, but we’d need to ride south down the main road to get to it. Traffic was thick, especially towards Highway 20 where the hotel was. Once we’d settled in and cleaned up, we headed to the Country Junction for an early dinner and a few beers. The sun already had some sting in it as we headed back through Dyersville and turned west following 1st Avenue out of town. We passed the Basilica of St Francis Xavier, a proud landmark amongst the cornfields and treasured by the locals. It was constructed way back in 1887 to serve the increasing number of Catholics moving to the area to farm and is one of only 53 basilicas in the US. After about 30 minutes of going shoulder to shoulder with grain trucks, we turned north again onto 300th Avenue and headed up the gun-barrel straight highway to Petersburgh. The lack of services here meant we only stuck around long enough to cool off in the shade and admire St Peter and Paul’s Church which totally dominates the tiny town. As we were about to pull out we had to give way to a parade of vintage tractors making their way slowly through the main street. Bedecked in American flags, they were all fully restored and looked amazing. That forced us to hang around a little longer as they were actually going slower than us! The tractor column continued up the road for another 5 miles before we lost them on a side road. The heat was beginning to tell again (around 36C, probably hotter on the road) and the hills had begun to grow, forcing us to make longer and longer climbs. We were grateful for the long downs though as the wind rushing past us cooled us off. At the next town, Colesburg, we managed to find a small Stop & Dash shop which mainly sold motor oil, but did have a fridge with some soft drinks and chocolate. Not a very filling lunch to fuel our push to Elkader though! 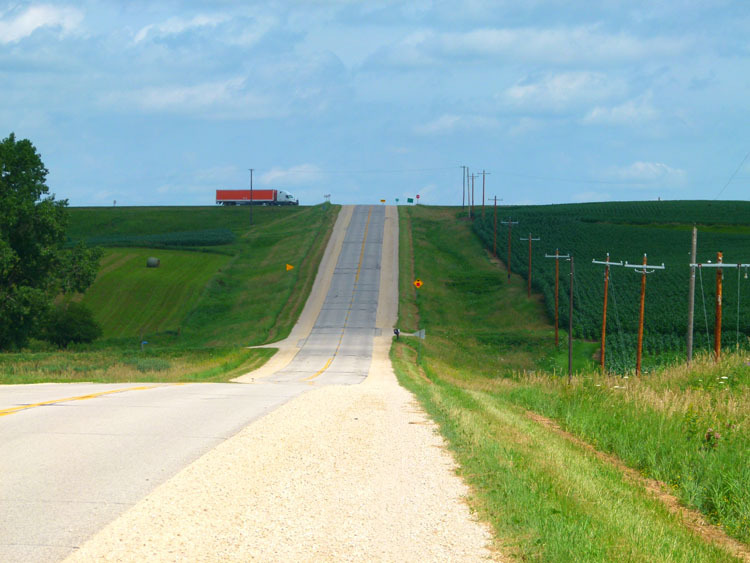 We took Colesburg Road north, the road gradually climbed onto a ridge where we thought we might be able to see the Mississippi again, but all we saw was more hills. One of these hills led us down and down into what remains of the town of Elkport. The main town had been completely drowned by floodwaters a couple of times in recent years and people had abandoned it. All that remains is a campground and a garage with a small shop just up the road toward the junction of the Turkey and Volga rivers. We stopped and got something to eat, we were both pretty hungry by now, having had little since breakfast. The only table in the shop was taken up by a couple of scruffy-looking local types, so we headed across the road to the shade of the small local bank. From Elkport we took the X3C and immediately began to climb. The signs now read “Grandview Road”, we looked at each other, we both knew what this meant. If you want the best views, you had to climb – and we did. After a number of prolonged climbs, which I thought we tackled well, Grandview climbed up to and followed a ridgeline for some way. It was a nice reward for our efforts and the views seemed to revitalise our tired legs and give us the energy we needed to continue. 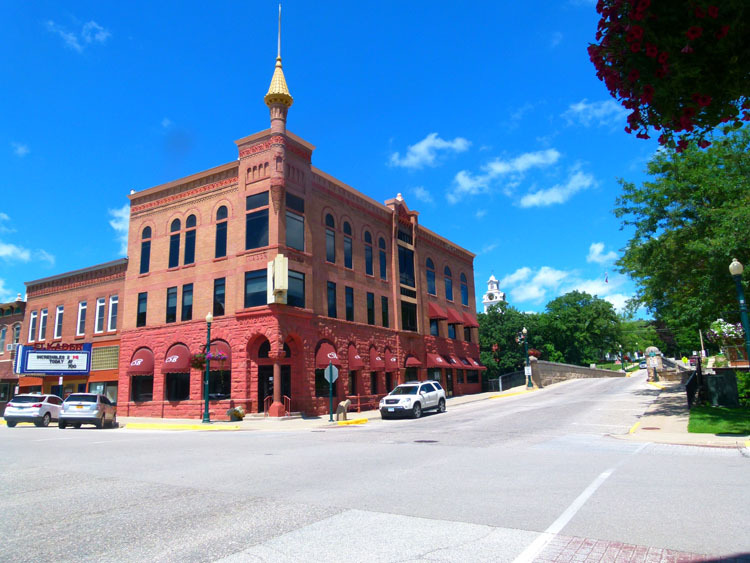 With our strength renewed, we descended down to State Road 13, which led down to Elkader. This road was as busy as hell and the traffic was moving scarily fast. The shoulder on the road was wide but pretty rough, but we were almost there now, so we slowly negotiated the rocky surface and turned into Elkader. 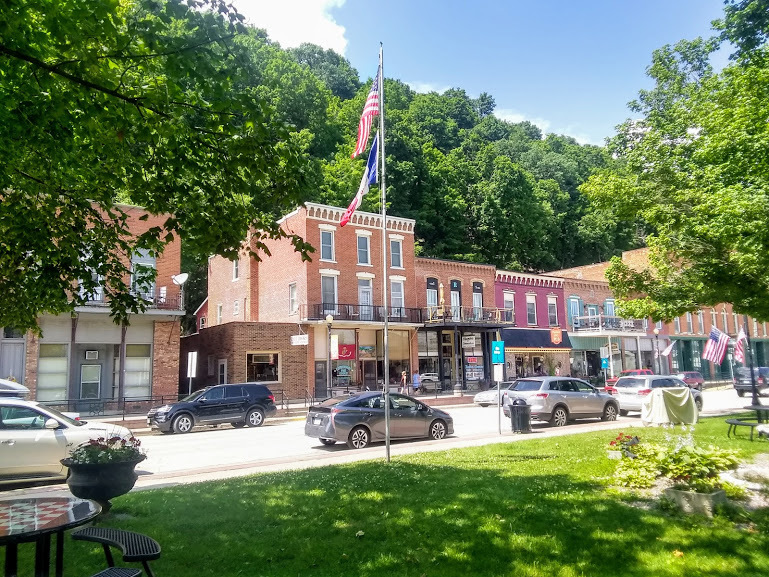 The pretty, little town straddles the banks of the Turkey River and has a campground set on its outskirts alongside the highway. 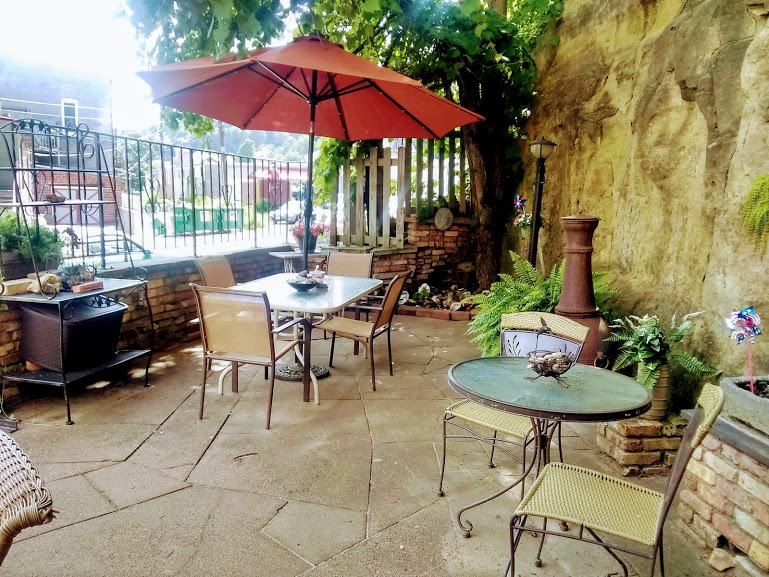 We immediately found what we wanted – an air-conditioned cafe to get a cold drink and cool off. Treats on Bridge Street was popular, but only had one person to serve behind the counter and make all the drinks and sandwiches. 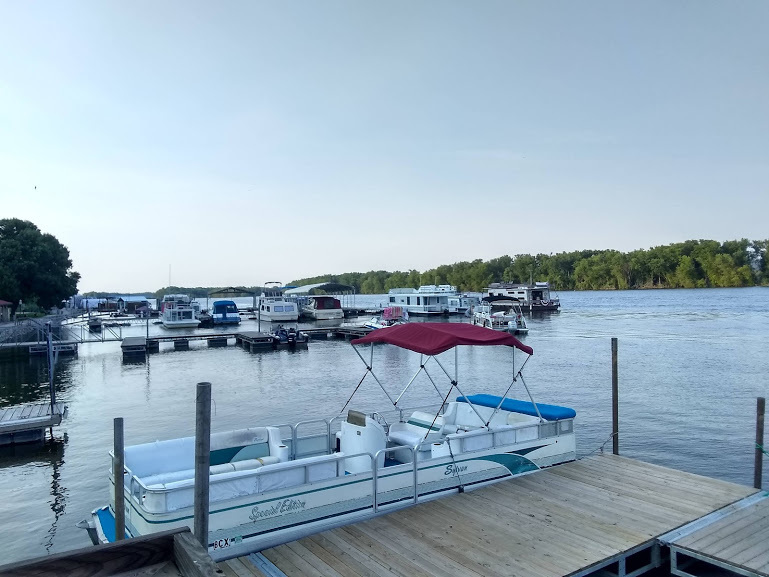 It took a while, but we eventually settled back with our drinks and started to look at the next day’s ride to Marquette on the banks of the Mississippi. Not wanting to go back and forward to the campground for dinner, we headed over to Fennelly’s Irish Pub, just around the corner. We ate an early dinner (an Irish stew) and took some beers with us back to the campground. The park was small and had an honesty box. It cost us $15, which seemed steep seeing we slept for nothing in all the other small towns, but it was managed by a number of local church charities, so we figured it was well spent. We waited to the sun sank below the trees before deciding whether to pitch the tent. It remained too hot, so while Shazz slept on the table top once more, I decided to sleep on the tarp on the grass. It took some time for the traffic on the adjacent highway to thin out though. We had to ride on the gravel shoulder again this morning, but only for about a kilometre. From then on, State Road 13 was a challenge. Thankfully our shoulder improved and turned into bitumen, but the road got very lumpy and stayed that way all day. At one point before turning off SR13 we had to ride on the loose gravel shoulder for about another 5kms, as the bitumen shoulder disappeared, it wasn’t fun. The shoulder was angled into a ditch and the gravel was soft in places allowing our heavy bikes to sink in. It was dangerous, plain and simple. Frustratingly, we wondered why we were routed down this road on touring cycles. We were glad to turn west onto the 182nd and roll down into Farmersburg, a tiny community about 4kms off the main road. There were no services in town so we pedalled on turning north once more toward Monona. This road, Golden Avenue, was a real roller coaster. We needed to stop at the top of each hill to regroup and catch our breath. Shazz was struggling a bit but was doing her best to keep up. We turned off Golden Avenue at the top of a very steep hill, unfortunately, we were headed onto SR18, a very busy road with a small shoulder and lots of truck traffic. Those 2kms into Monona were as scary as any we’ve ridden, I even elected to ride off of the shoulder in the gravel so as to give myself some extra space. It was hard pedalling in the soft gravel, but I figured getting there in one piece was more important. And we thought we were meant to be enjoying ourselves! We pulled immediately into the Casey’s in Monona, bought ourselves a cold drink, and sat down on the ground in the shade in front of the store. 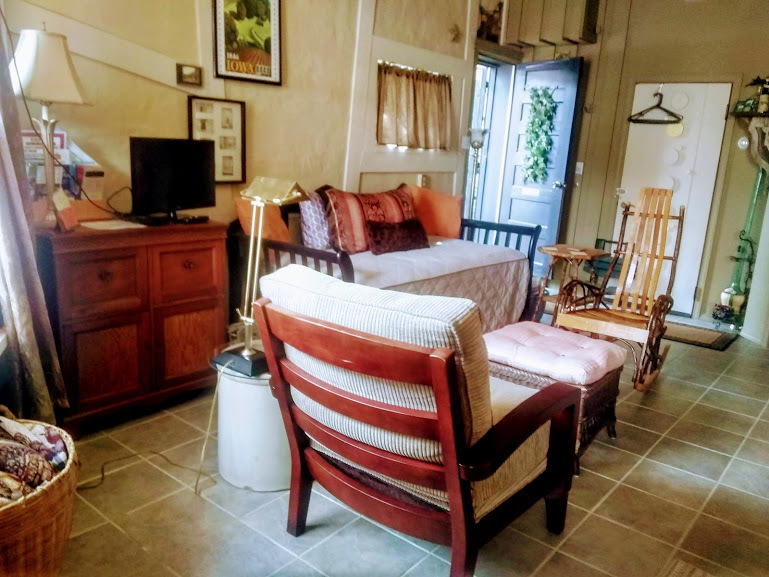 Not being able to find a place in Marquette (the campground was way out of town and up a big hill), we booked a BnB in McGregor, just one mile down the road. This done, we turned down Pleasant Ridge Road and crossed over a reasonably flat plateau that led to the Mississippi River at Marquette. The final 5kms into Marquette were all downhill and winding. We had to ride the brakes all the way down so as the bikes wouldn’t get away from us. By the time we got down to the bottom, our wrists were aching from clutching at the brakes all the time. Along this stretch of the Mississippi, sandstone cliffs line both sides, so any riding along it involves lots of climbing and descending on roads with almost no shoulders – not much fun at all. We ended up spending 3 nights in McGregor as my elbow flared up and became quite painful, too painful to ride even! The Old Jail-Firehouse Guest Suite was amazing, just what we wanted after some very arduous days on the hills. Richard, the owner and his wife, were fantastic hosts and we’d thoroughly recommend the place. The town itself is very small but has a very pretty (and busy) little main street bedecked in red, white and blue bunting. Down on the riverbank, you can really appreciate just how big the river is, and how fast it flows. No place for a non-swimmer like myself! After talking with Richard and a few townsfolk, we were convinced that the other side of the river (in Wisconsin) was a far easier and safer route to take north. Previous story Who Said Iowa is Flat? !